We’ve also back Spurs and Chelsea to draw in their London derby and Jamie Vardy to be upstaged by another Englishman. Coutinho is currently Liverpool's most influential player. EVERYONE IS TALKING about Jamie Vardy’s meteoric rise from non-league obscurity to Premier League top goalscorer right now. After equalling Ruud van Nistelrooy’s Premier League record by scoring in his tenth consecutive league matche last weekend, the Leicester City striker, who has netted 13 times in as many top flight appearances this term, can go one better against the Dutchman’s former club on Saturday. And while you wouldn’t put it past Vardy continuing his remarkable run when leaders Leicester face second-placed Manchester United, we’re going to take a punt on another Englishman who is better priced. The 22-year-old attacker has started each the club’s last four games, scoring against West Brom earlier this month, and is 9/1 to score first compared to Vardy’s 11/2. Languishing bottom placed in the table and five points adrift of safety, Aston Villa have got real problems at the moment. The decision to sack Tim Sherwood and replace him with Frenchman Remi Garde has yet to prove a good one, and although he is less than a month in the job, last weekend’s 4-0 drubbing at the hands of Everton will have hurt supporters. We’re backing Villa to take a point at home to 13th-placed Watford, while also predicting Sunderland to hold Stoke to a draw at the Stadium of Light after their 1-0 win away to Crystal Palace last time out. Unbeaten in November having racked up 11 goals in their last three games, Everton will go to Dean Court full of confidence that they can push themselves into the top six with a victory. Bournemouth claimed a point away to Swansea last Saturday but it was their first in five league attempts. Fourth-placed Arsenal, meanwhile, bounced back from their loss to West Brom by keeping hopes of progressing to the Champions League knockout stages alive with a 3-0 win over Dinamo Zagreb in midweek and the Gunners should prove too much for Norwich. The general consensus is that Tottenham are growing into a formidable team under Mauricio Pochettino. Chelsea boss Jose Mourinho may have gone slightly over the top by saying this week that he believes Spurs can win the title but there is no doubt they should have realistic sights on a top-four finish. Chelsea, ten points behind their London rivals in 15th, appear to have steadied the ship in recent weeks after an abysmal couple of months but this will be their biggest test in the league since the 3-1 defeat to Liverpool in October. The last three meetings between these two reads 4-0, 3-0, 5-3 so there is likely to be goals, but we’ll go for a draw with both teams netting. Like a number of players at Liverpool, Philippe Coutinho’s return to form has coincided with the arrival of new manager Jurgen Klopp. The little Brazilian has been immense for the Reds recently, scoring four goals in his last three league outings — against Chelsea, Crystal Palace and Manchester City. He came off with a minor strain on Monday night but should be fit to start. On Sunday afternoon, Anfield hosts a Swansea side looking out-of-sorts with Garry Monk coming under pressure as they have picked up just one win from nine attempts in the Premier League. Email “Coutinho to strike again and the other Premier League bets to consider this weekend ”. 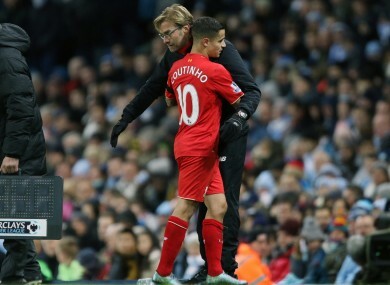 Feedback on “Coutinho to strike again and the other Premier League bets to consider this weekend ”.